Never pay for roaming in South Africa again! We created travSIM for you to enjoy an easy, worry-free way of staying connected wherever you are! We offer you a worry free way to make calls, send SMS’s and connect to the internet in South Africa. You get a local South African SIM card and can enjoy the cheap local rates in South Africa. Depending on the option you choose you get free minutes to the South Africa landline and mobile networks. You also get SMS bundles and mobile data to use with your smartphone, tablet or laptop. The SIM card is suitable for all kinds of devices. Please ensure that the devices you want to use are SIM lock free. The internet is uncapped to the data amount offered in the option. You can call other countries as well only the amount of minutes will be less. See under tariff for more details. 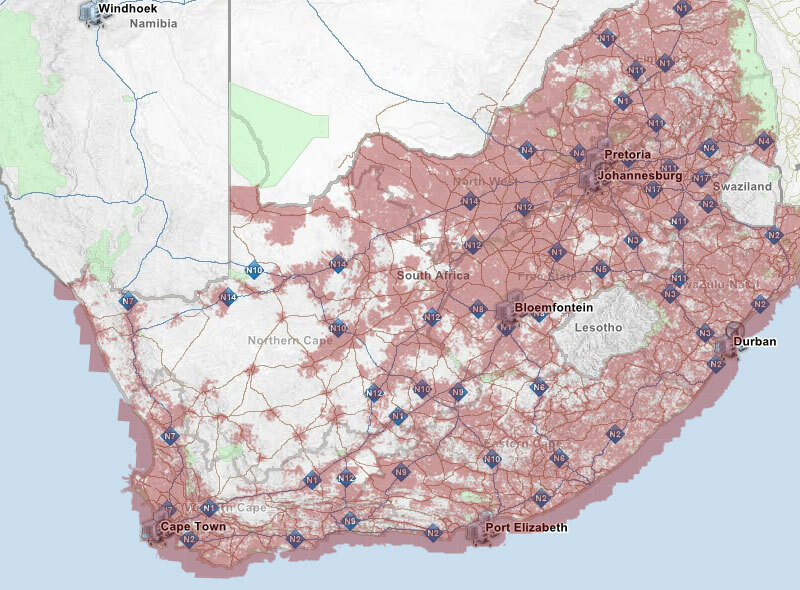 This above coverage map is for the network coverage of Vodacom in South Africa. All populated areas are covered and big cities have a LTE coverage. This picture is just to give you a general overview. Please go to following website to view the interactive map. Please click here to view the full Vodacom Coverage map and check coverage for your city or area. The network provider is Vodacom South Africa. For more information please also view the website of the network provider. travSIM is not a network provider and therefore cannot guarantee for the quality or network coverage. However we choose Vodacom as the network provider as it has the best voice and data network quality in South Africa. Please note these prices are subject to change. If you can, to make any international calls please buy one of the international otion to qualify for very cheap international call rates.